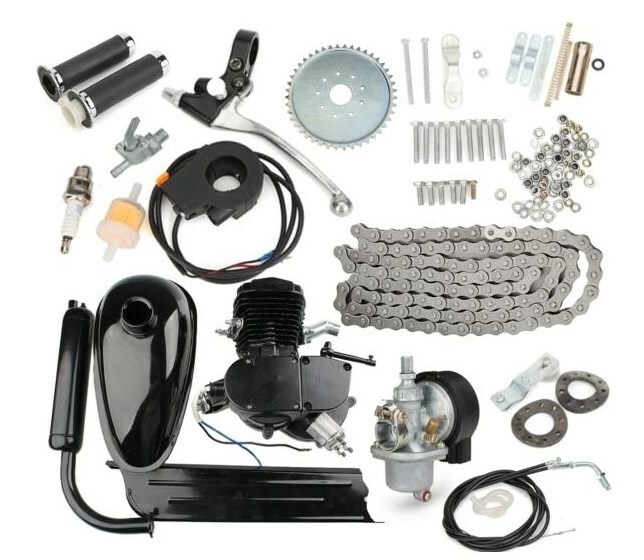 Make Motorized Bicycle (motorized bike) at home with 80cc 2-Stroke body engine motor kit. 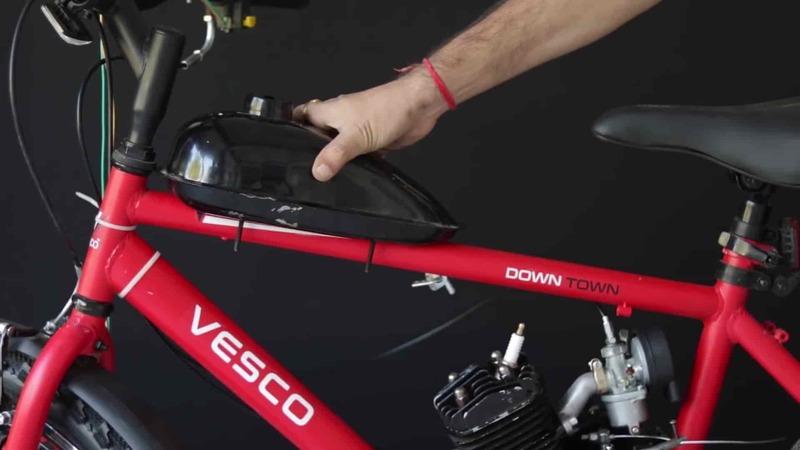 This motorized bicycle can run up to 40 km/hr speed. 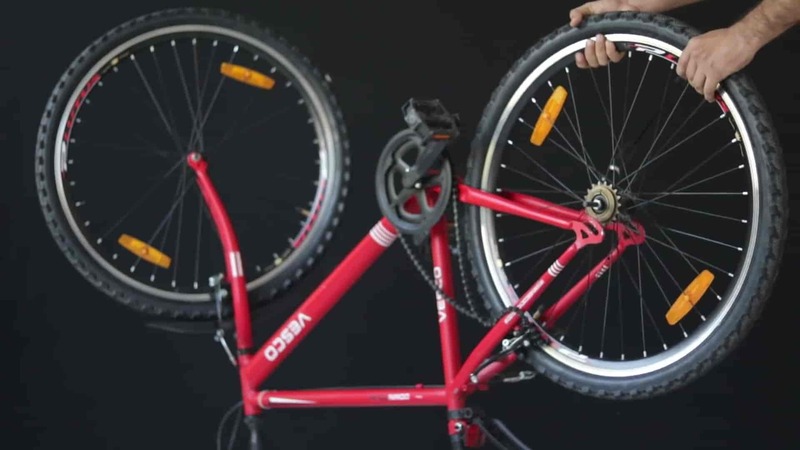 This bike also called Petrol bicycle because it uses petrol as a fuel to run. The motorized bicycle is a bicycle which is run by a motor or engine which is fitted on a bicycle stand. this engine can start by the pedalling. This project was not very easy for who don’t know the knowledge of bike. but you don’t worry about that. 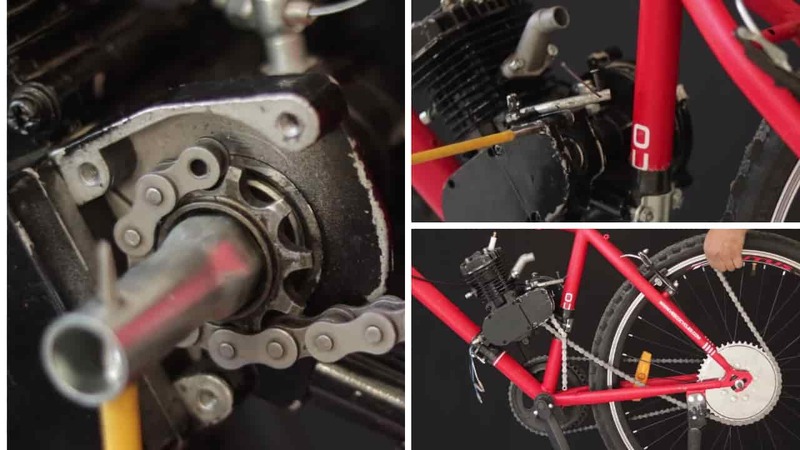 I will show you all the details step by step process to build your own motorized bicycle. In this project, I also face many problems. I want to share this problem with you. if you know that problem I faced. 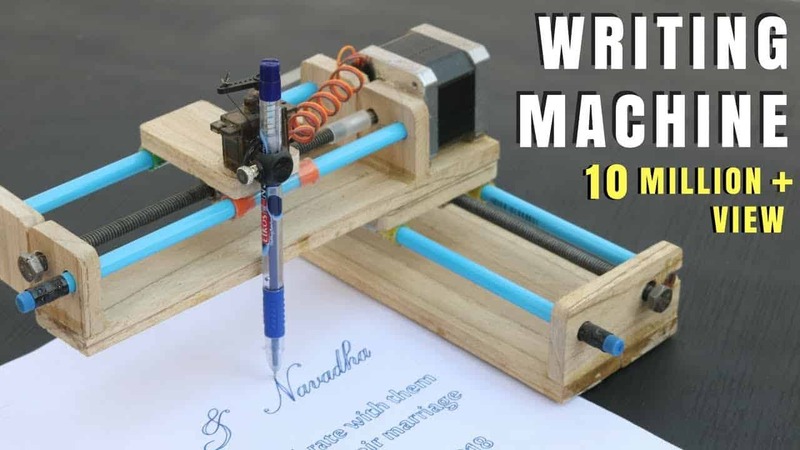 then its great easy way to make the project. Your bicycle must have one steel road on the upper side to install the petrol tank. 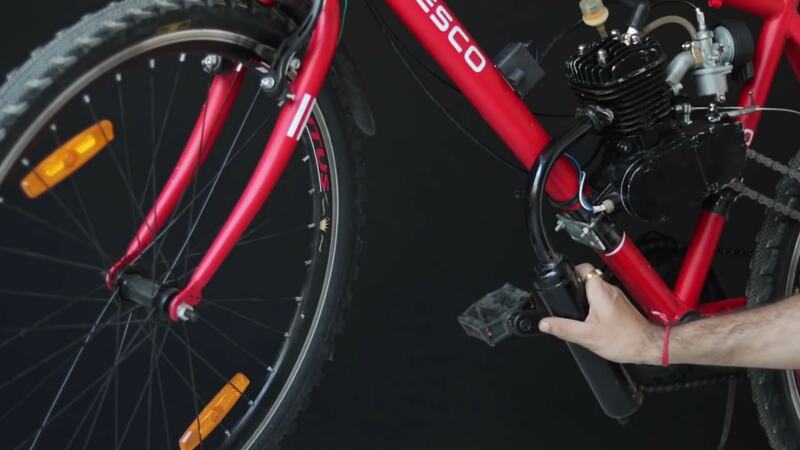 Motorized bicycle kit is also important. do not buy parts separately from other sites. buy it full kit. you can Choose disk brake bicycle so you are safe at high speed. Must check the specification of an engine. it can be full feel your specific application. after buy product, it may not have a return policy. The first step is to buy a bicycle. you can not buy any bicycle because we have to install the engine and petrol tank in the cycle. The bicycle must have great frame structure to accommodate engine and tank perfectly. 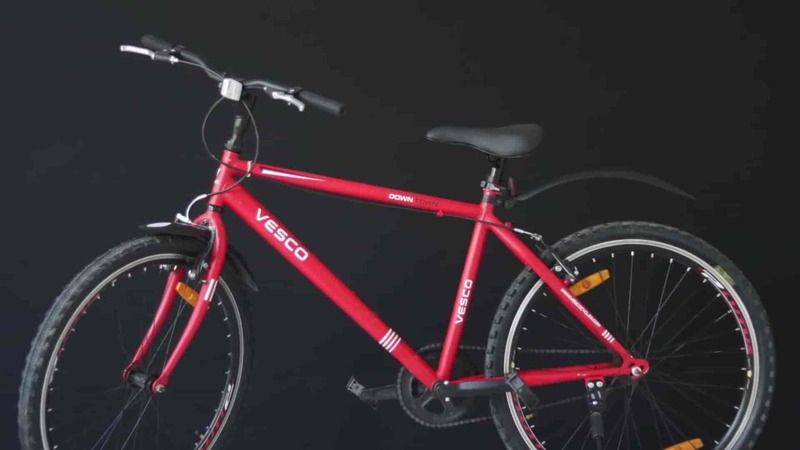 I used Vesco company bicycle. you can see frame structure of that bike below. you can see in that bicycle have triangular space in the frame. so our engine will easily accommodate. Now its time to buy engine kit for a bicycle. you can get this from many websites. I was bought this from a banggood website. This engine was 80cc – 2 stroke black body type. This Engine is Kickstart. No battery required to start the engine. you can buy this kit link given in the material list. 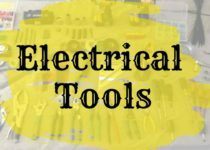 and other tools required for assemble kit you can buy it from tool list. but it’s not necessary to buy. you can use whatever you have with you. In this project, we can not use the old sprocket of bicycle because it will not gives you high torque. now we fit the new big sprocket come with engine kit. 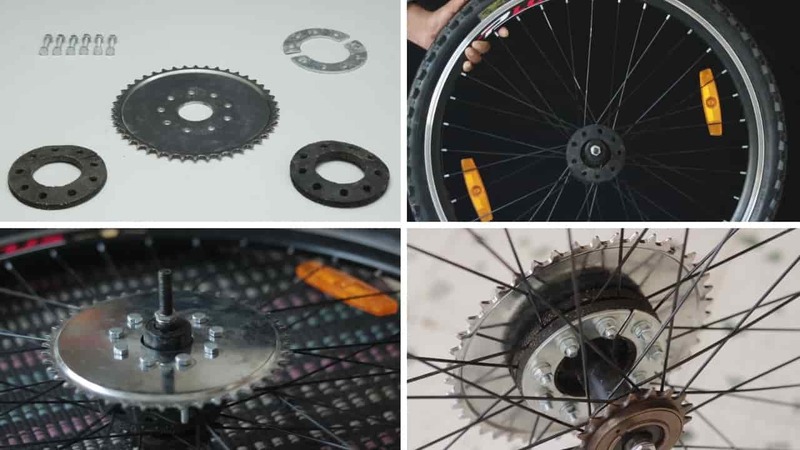 follow the below step fit the sprocket. you can follow below picture to understand carefully. 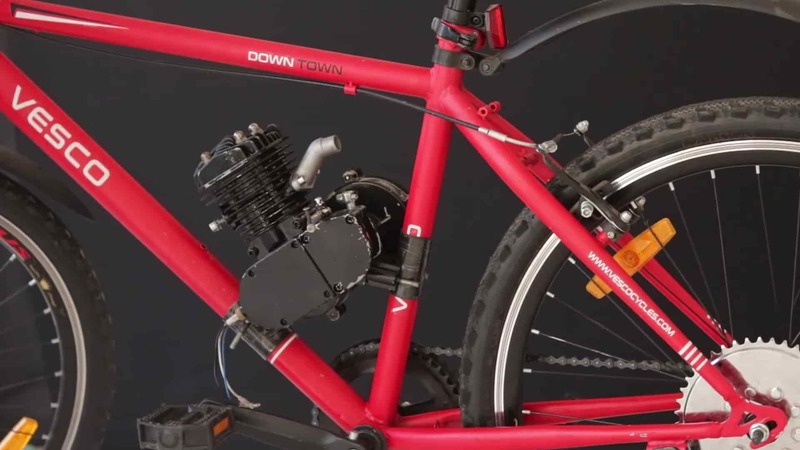 Take the 80cc Engine from the kit and put it between the frame of a bicycle. These Engines have the mounting bracket can fit in the frame with the help of a nut. you can see below image how they fit inside the frame. The spark plug is used for the spark the petrol during starting and working. 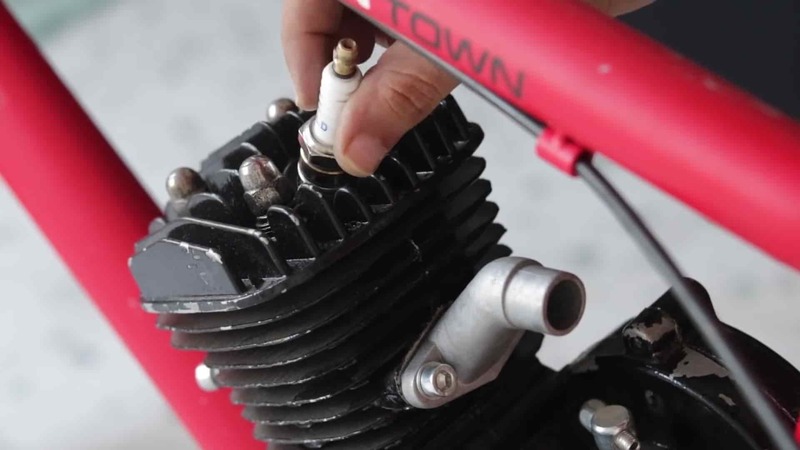 Attach this spark plug at the upper side of an engine by rotating it. If a spark plug is not fitted carefully than your bicycle will not start. Clutch is used to engage and disengage the engine with a driven shaft. This clutch looks like a handbrake. 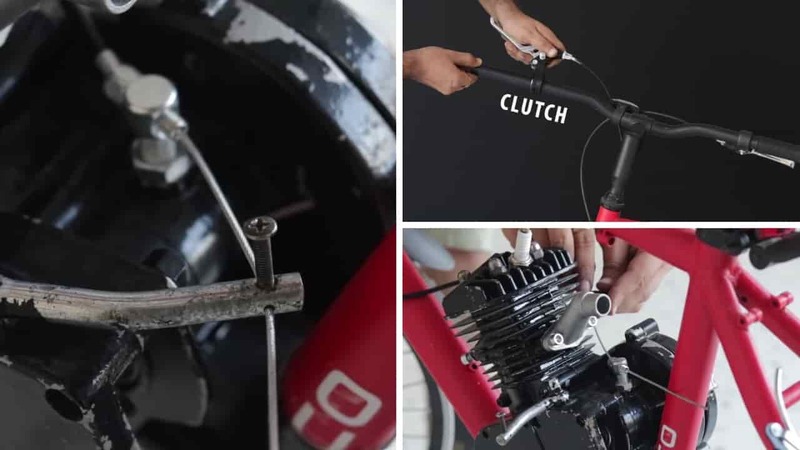 we install this clutch in the left side handle of a bicycle. Follow below step for the fitting of a clutch assembly. 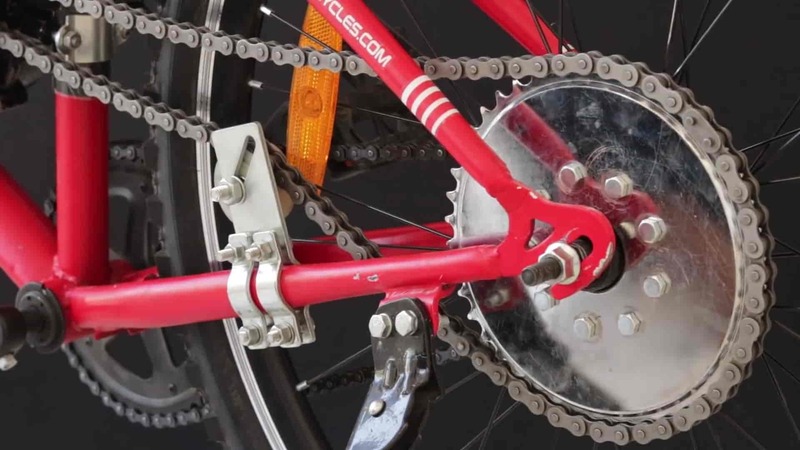 The chain is fitted between engine shaft sprocket and bicycle sprocket. you can follow below step. If you not able to tight chain properly than you can use chain tensioner by tightening it by the bolt. This tensioner is tight the chain by pulling in it. Accelerator increases the fuel supply. 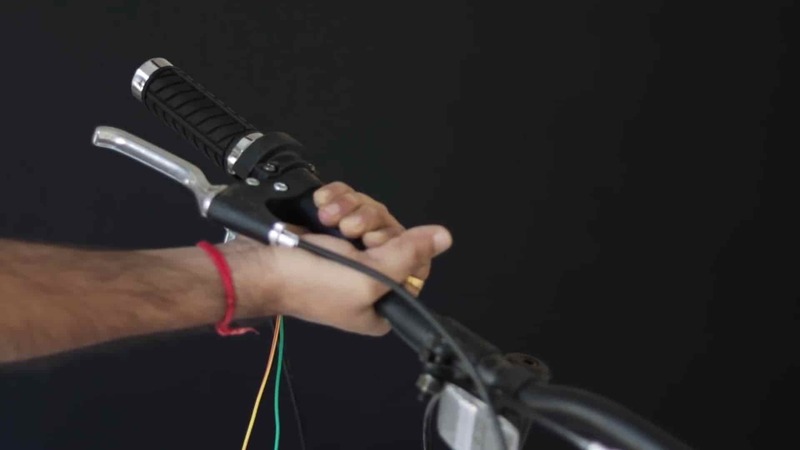 Accelerator bar is fitted at the right side of the handlebar. A carburettor is supplying the proper air-fuel mixture to the engine. 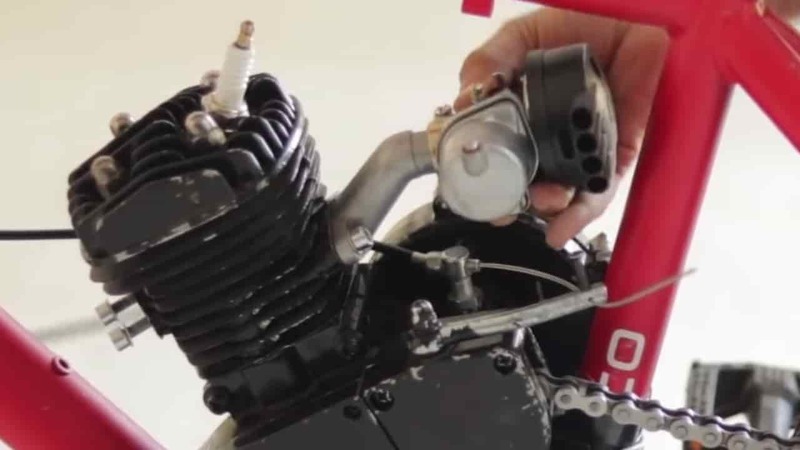 Attach the carburettor with the manifold of the engine. must be noted that cable is in the straight position. Now its time to set up a petrol tank. This petrol tank is a capacity of 2 litres. Put this tank at the above straight bar of a bicycle. Tight the tank with the help of the bracket. Now join the exit manifold of the tank with carburettor by using the tube. 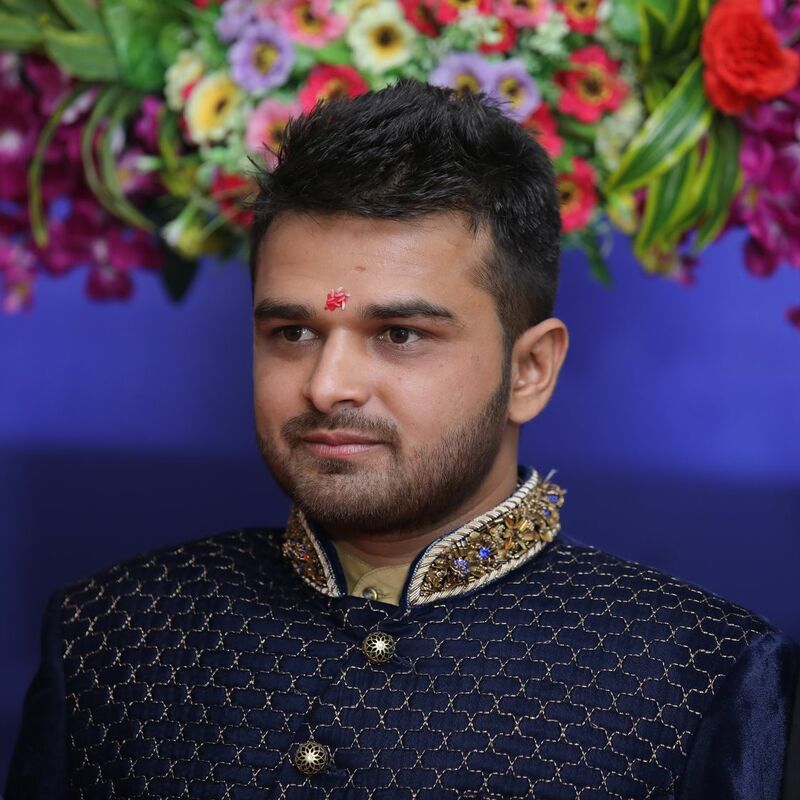 you can see in below image. 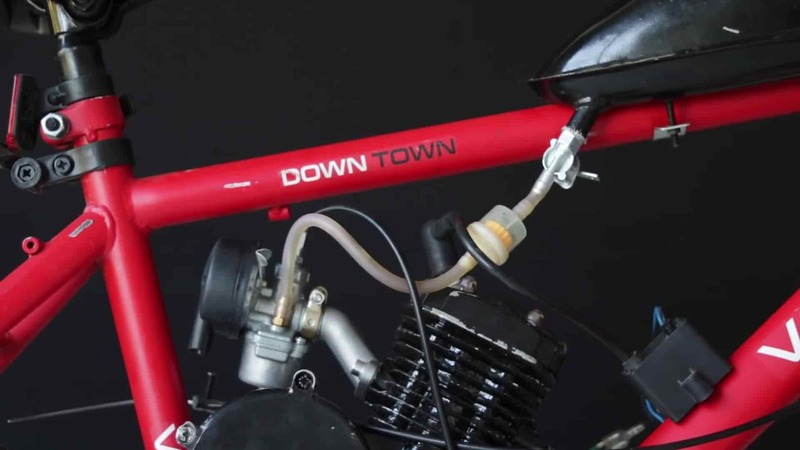 The muffler is set up for an exhaust system of the motorized bicycle. This muffler reduces the loudness of sound pressure done inside an engine. Muffler also called as a silencer. It’s time to insert fuel inside the petrol tank. 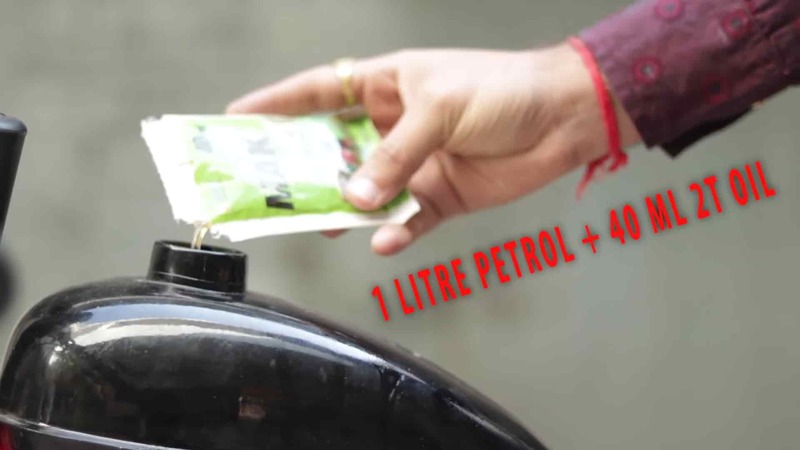 First, insert the 1-litre petrol inside the tank. than insert 40 ml 2T oil. This oil necessary to insert for a lubrication of piston and engine. 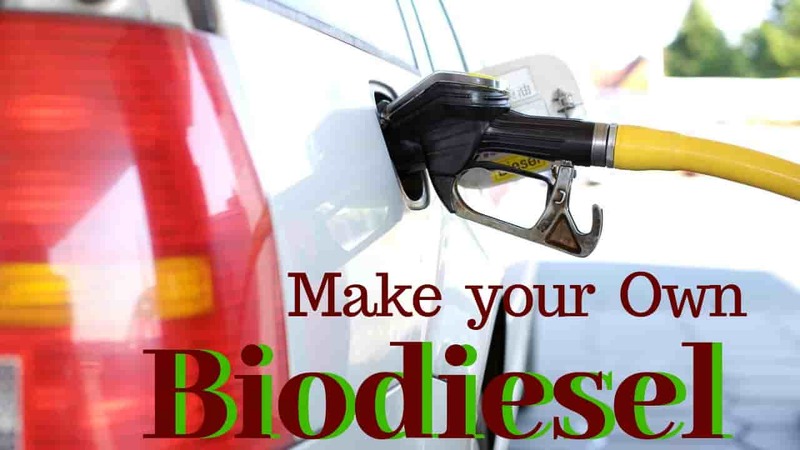 In this type of engine, you don’t need to put oil in advanced. Here we don’t have battery startup so we need to ride the bicycle. follow the below step for riding the motorized bicycle. I hope your engine will be started and you can enjoy your ride. But be safe about braking. I hope you can make motorized bicycle at home easily. but if you not able to do it I will help you by showing video tutorial in our youtube channel of creativity buzz. we are generally put the video on science fair project. you can subscribe to my youtube channel. If you like my blog then do your comment below if you have any doubt. 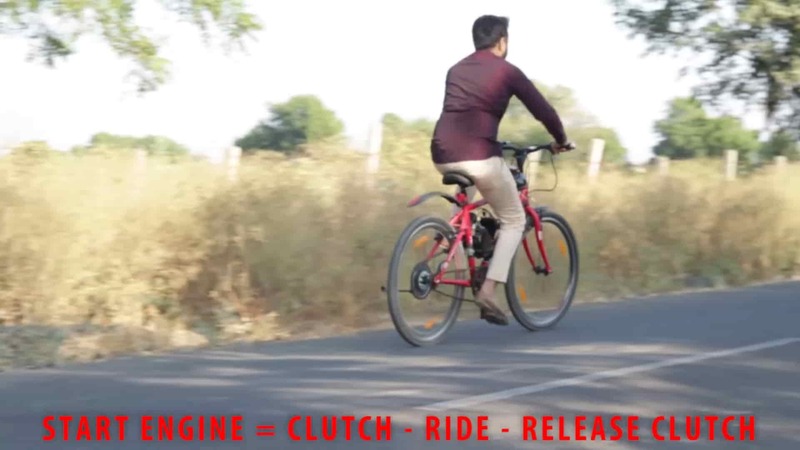 I also made a video on the electric bicycle you can see by clicking below. you can see another blog on How to make the hoverboard at home. Thanks for reading my blog on how to make motorized bicycle.